Stirling Netball Club are starting off a brand new junior section at McLaren Leisure Centre! If you or your child is in P5 - S1 - this is for them. 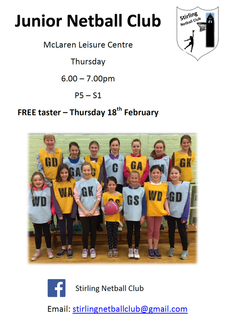 The club have a free taster session for everyone attending on their opening night on Thursday 18th February. The class will be every Thursday, 6pm - 7pm. If you're interested and would like more details about this, please get in touch with the netball club on stirlingnetballclub@gmail.com or like them on facebook. 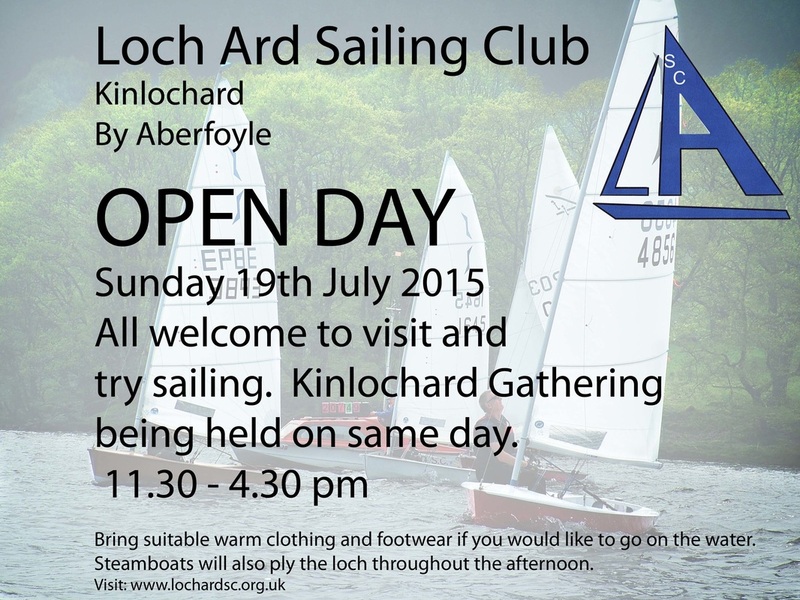 Loch Ard Sailing Club are hosting an 'Open Day' on Sunday 19th July between 11.30-4.30pm. Everyone is welcome to come along and try sailing! All you need to bring is warm clothes and footewear as well as plenty of enthusiasm for a fun day out for the family! 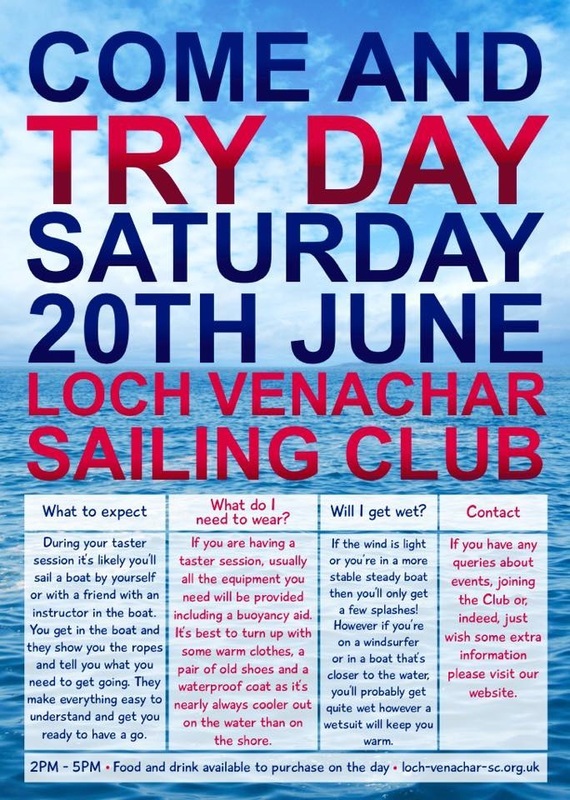 Loch Venachar Sailing Club Open Day - Saturday 20th June! Check out some of the photos from Loch Venachar sailing Club's Open Day! Are you aged 16-19 years old and interested in a career in sport? 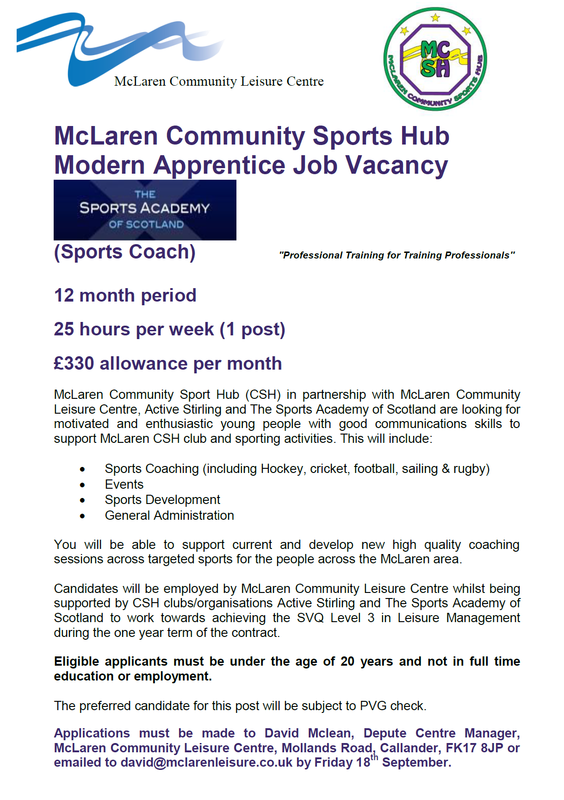 The McLaren Community Sport Hub has an exciting opportunity for a young person to take on a Modern Apprenticeship in Sport. The job will see the postholder working with McLaren Leisure Centre, Active Stirling and a network of local clubs creating opportunities for more people to get engaged in sport! Over a hundred club members and supporters attended McLaren’s Rugby Force event on Saturday, 9 August which was enriched by the attendance of three of Scotland’s emerging international rugby stars – outside half Finn Russell, scrum half Henry Pyrgos and lock forward Tim Swinson. 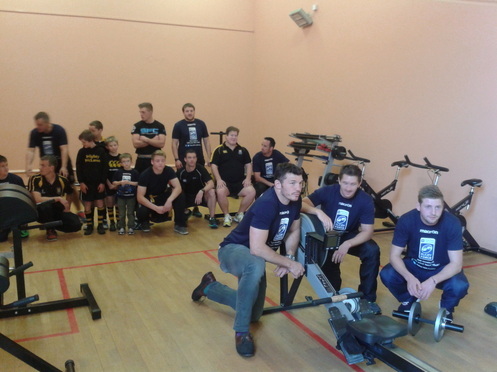 The event kicked off with the opening of the club’s new strength and conditioning suite at the Leisure Centre, thanks to the generous financial support from the centre itself, ClubSport Stirling and the Council’s Community Fund. Everyone then moved outside onto the new artificial ‘3G’ pitch where the club’s oldest and youngest players enjoyed a lively session of touch rugby with our international guests, who are professional players with Glasgow Warriors, enthusiastically joining in. The morning’s activities were rounded off with a lunchtime barbeque hosted by the club at Callander Youth Project. Not a scrap of food was left, testament to the amount of energy expended by one and all earlier in the day! The club will be celebrating its quarter century this season and will shortly resume playing home fixtures on the new pitch next to the primary school. The website has been developed as part of the Community Sport Hub project from Scottish Government's Legacy Investment through sportscotland in the McLaren Community. The sporting stakeholders in the community have worked together over the last 12 months around a variety of projects aimed at growing sport in this community. One of the key challenges that they identified was being able to promote themselves in a simple yet effective manner.